Happy Thursday guys! 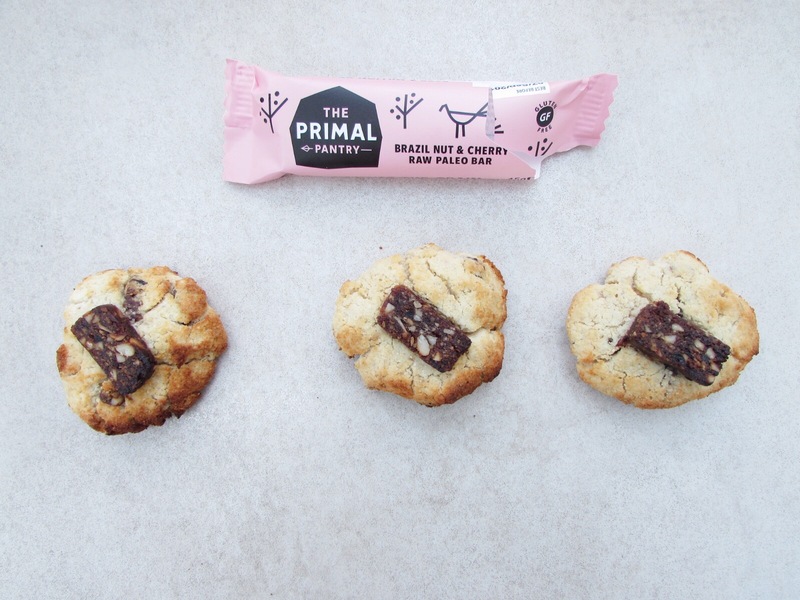 I have been trying out so many new different products as of late (all of which have been delicious) and I have now collaborated with the Primal Pantry who kindly sent me a range of their paleo bars to try and work into a new cookie recipe I have developed. The recipe below has incorporated their brazil nut and cherry bar however I have also made these with their coconut and macadamia nut bar which is just as yummy! In a bowl, combine the coconut flour, oats and baking powder. Then add the coconut oil (melted), agave, vanilla paste and flax seed egg. You may find it easier to combine the mixture with your hands so you achieve a thick dough like consistency. Finely cut up one primal pantry bar (your choice of flavour) and work into the mixture. Tear off bits of the mix and mould into 10 individual cookies, placing them on baking paper. Cut up the remaining bar and place a small piece on each cookie (as shown in picture). Place the cookies in the oven and bake for approximately 20 minutes until golden.